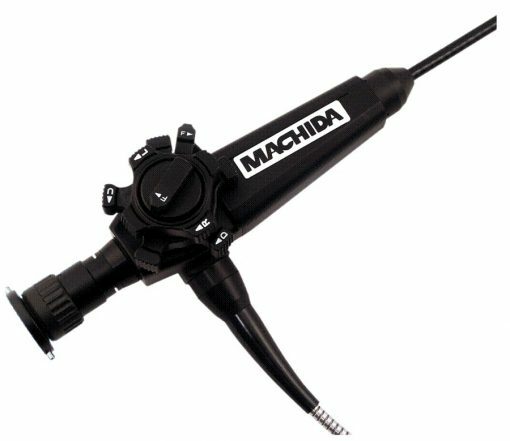 Machida’s largest body type is particularly suited to longer borescope lengths up to 20 feet. The most outstanding feature of the smooth knob type scope is the huge, high definition images you’ll be able to achieve. Its lightweight structure and flexible maneuverability make this a super functional instrument that allows for complete inspections of larger diameter cavities. With professional care, the rugged cast aluminum construction will last a lifetime. The Knob Type Scopes are available in diameters from 8.0mm to 12.5mm and can be customized. The high tech design allows for four-way angulation resulting in an expanded coverage area. A permanent 90° side view prism is available on the 8mm and 12mm at no additional charge. On most models the durable, chemical resistant, non-abrasive polyurethane outer covering can be replaced by an impregnated steel mesh at no additional charge. Scientifically and ergonomically designed to easily fit in and be operated by one hand. This unique, user friendly, fatigue-fighting, lightweight design will yield hours of comfortable performance while working on the most tedious and critical inspections. Slight pressure on the control knob will hold those critical images steadily in place.